Nitin Rubber Industries has its footprints in manufacturing world class quality moulded rubber products made up from Natural as well as Synthetic rubbers like Nitrile, Neoprene, EPDM, Butyl, Hyplon, Polyurethane, Silicone and Viton Rubbers to suit customized requirements of various industrial and commercial applications. We manufacture variety of Rubber Seals, Rubber Gaskets, Rubber O Rings, Rubber Diaphragms, Metal to Rubber Mounded Parts, Rubber Bellows for submersible pumps, Rubber Bushes, Many articles for Pharmacy & Medical Disposables, Variety of components for Oil & Gas Fields exploration industry and Piped Gas Providers, Oil emerged Power Capacitors, etc. The components developed by Nitin Rubber Industries have been found accepted by inspecting agencies like Loiyd’s, UDHE, PDIL, SGS, etc and are confirming to international standards. NRI developed Radio Frequencies sheet (RF sheet ) for radar in sea, Viton rubber components for oil exploration industry confirming to ASTM; many OEM components for Texture & Twisting machines manufactured by Himson group ,Surat(under technical collaboration of SCRAGG, ENGLAND); also developed thin wall-thickness diaphragms for pneumatically controlled valves manufactured under technical collaboration of MUESCO & VALTEK, AMERICA; and also successfully developed high-heat resistant rubber components for induction melting furnaces. Nitin Rubber Industries has emerged as an OEM as well as Replacement supplier to many organizations of repute. 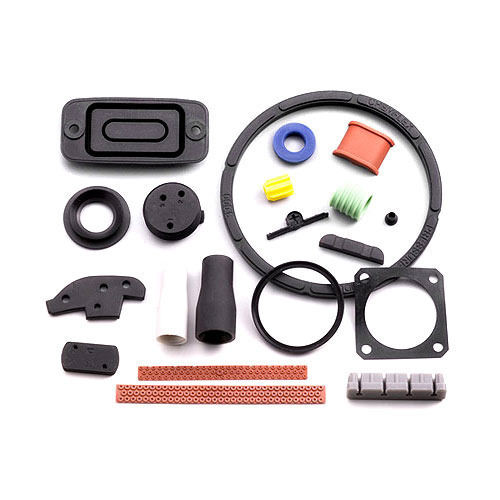 We have been trusted for Moulded Rubber parts by such organizations who have made name in the industrial world by sheer quality of their machines and products.